The End Vent Slider is the solution to maintaining a view and gives the flexibility of ventilation. When a Bay and a Bow window cannot be used due to their outward projection, a custom End Vent Slider becomes the window of choice. Double glazed sealed units with Intercept spacer for optimum insulation value. Low emissivity (Low E) glass that provides maximum energy efficiency. Argon gas for optimum efficiency. Left and right sash tilt into the house for easy cleaning. Sliding sash window with left and right operator. Larger fixed center sash for a greater view. Fusion-welded frame and sash corners. Continuous, integrated sash handle for easy operation and clean appearance. Durable metal lock and keeper for greater security. Interior – white or ivory. Various tinted and textured glass available. 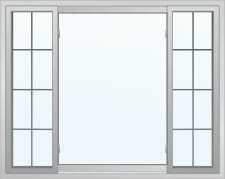 The window can be retrofitted to a replacement or a new construction application.